After they submitted their proposal, I had individual meetings to discuss their project. Together, we tweeked their ideas so that they didn’t require too much new vocabulary (I don’t want them to be reliant on a dictionary). We also made sure that they would be able to talk about the past and future. As we met, I edited the spreadsheet to reflect what we discussed. 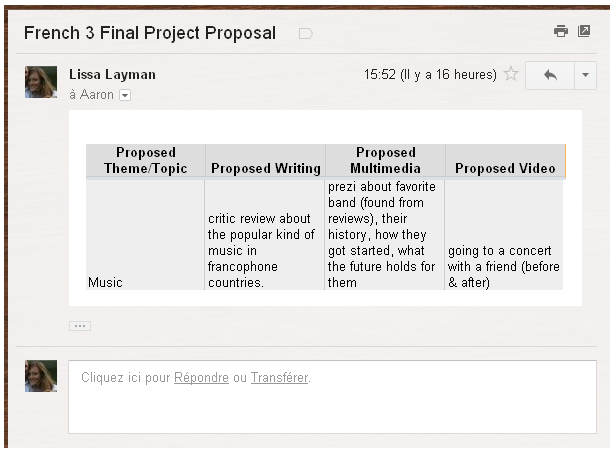 After class, I took screen shots of their final proposals and emailed them to each student. They have the rest of this week, plus the week that we come back from break, to work on the projects. It is completely up to them if they work on the projects during break…but if they use class time wisely, they shouldn’t have to do too much at home. We shall see what happens!